My little guy is 6 and he wants to be a baker when he grows up. He loves helping in the kitchen but I am sometimes at a loss figuring out recipes that he can help with. 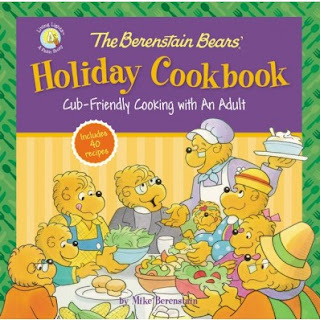 I was so excited to receive The Berenstain Bears' Holiday Cookbook: Cub-Friendly Cooking with An Adult because it is designed for little hands with Mom or Dad's help. This book features 40 recipes. Each of the recipe is from a certain season or holiday - Valentine's Day, Easter, Fourth of July, Fall Festivities, Thanksgiving and Christmas. The way it is broken up it is easy to pick one or two per season to tackle. Some of the recipes are simple like Easter Bunny Shakes or Cornbread and Honey Butter and others more complicated (but none are difficult) like Papa's Paw-Lickin' Good Chicken Wings and Colorful Christmas Poke Cake. I was able to find several things my picky eater would like to make and actually eat. Each of the sections starts with a bible verse and message. Then the recipes include full color pictures - which is wonderful because that is a peeve of mine when there are no pictures. The bear family pictures are throughout the book as well. This is a really fun book and would be a great gift for a child that wants to learn to cook.